Christmas is a coming, Christmas is a coming and what could be more magical than spending the day in the historic city of York? With so much to offer, from Christmas markets, festive-themed theatre productions and restaurants offering traditional fare, the biggest dilemma is what to do. 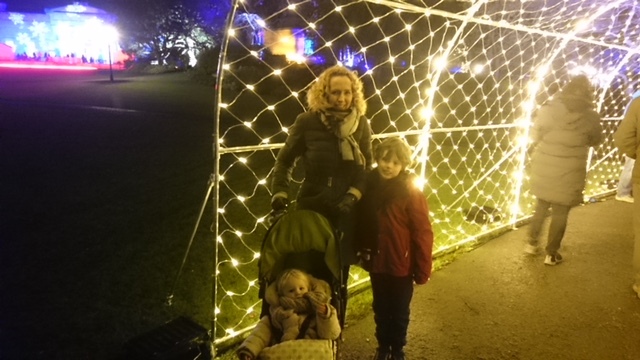 With our two young children, Archie, 8 and Tilly, 23 months, we opted for a few hours at the Winter Wonderland and an evening at the city’s very first Christmas lights spectacular in the Museum Gardens. Our first stop, which is situated at the York Designer Outlet on the outskirts of the city was a bustle of yuletide activity. 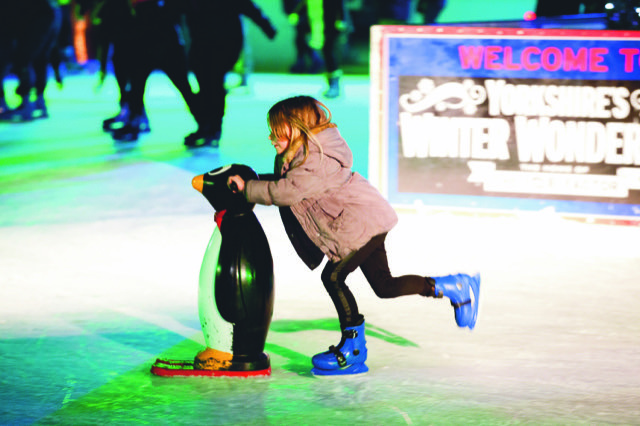 The main pull was the seasonal ice rink created with families in mind. While my husband, Iain and daughter Tilly, indulged in a luxury hot chocolate in the adjoining alpine themed Pappa’s Kitchen, overlooking the rink, Archie and I pulled on our skates for the hour long session. Prettily decorated with LED reindeers and a huge central tree, which must look even more magical during the evening sessions, the arena looked every part a Christmas post card. There were plenty of staff on hand to help anyone who’s a little unsteady or needs picking up after an inevitable fall plus ‘mini penguins’ support aids (additional fee) for the little ones. Archie and I had a ball and even my normally very fearful and nervous son was soon feeling brave enough to let go off my hand and glide across the ice. Afterwards, we warmed up in Pappa’s kitchen with a wonderful bowl of soup and a much needed mulled wine – Archie opting for a hotdog and tacos. Next to the ice rink is a mini funfair where we didn’t have to queue once and caters for children of all ages. 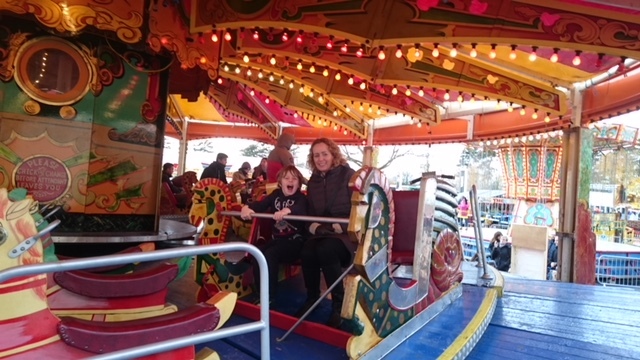 Tilly loved the traditional carousel and train ride while Archie and Iain headed straight to the bumper cars. Both kids were delighted when they won a penguin teddy on the Hook A Duck and in the end we had to drag them away as they would have spent hours going on every ride over and over again if we’d have let them. There is also a Santa’s Grotto which looked exceptionally magical but our slot for the light spectacular was beckoning. And despite it being one of the coldest evenings of the year, we couldn’t fail to absolutely love this wonderful and high tech display. From the second you walk through the arch of trees decorated with twinkly lights and baubles, you are drawn into a wonderful enchanting world encased in the historic Museum Gardens. 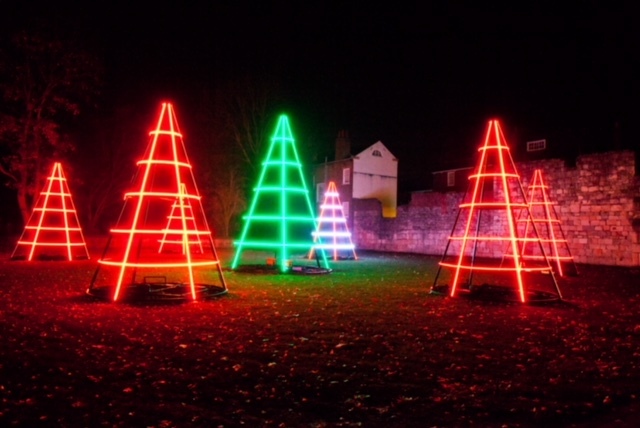 This brand new illuminated trail winds it way through the already beautiful and stunning medieval grounds. 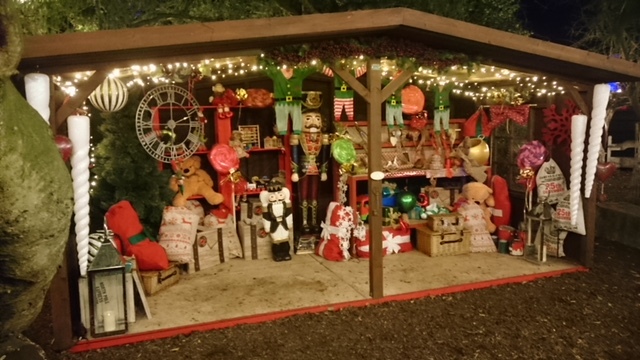 Entering the Fairytale Christmas village, children are invited to take a ride on the Victorian carousel or have their face painted (for an additional fee) while adults can opt to tuck in to a pie from the award winning Yorkshire Pie Company. But the big pull for Tilly was the life size wooden bear which seemed to attract children and adults alike. When we finally managed to pull her away, we embarked upon the illuminated trail that winds through the heart of the grounds, that is also home to the city’s botanical gardens. Set against the back drop of the medieval ruins of the St Mary’s Abbey, we wandered through a beautiful UV walkway where the trees were drenched in Christmas colours. My son was particularly impressed by the giant triangle modern day trees that changed colours – and even better he was allowed to run through them – a big plus for any 8-year-old. 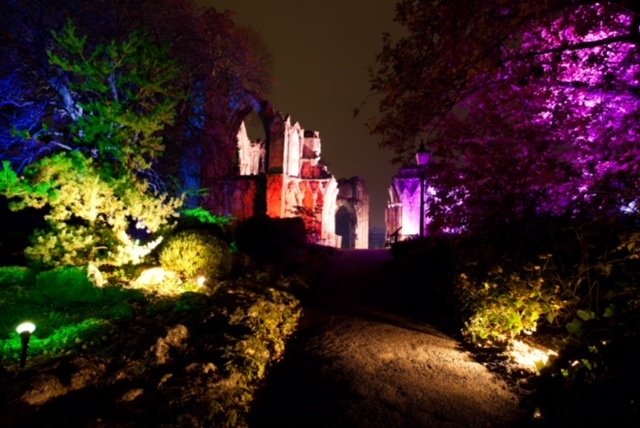 Nearby are the giant illuminated baubles which lead to a magical and enchanting projection onto the ruins of the Abbey. We could have stood and watched this all evening, as elves, Nutcrackers and of course Father Christmas dance across the walls. But there was still so much to see including a 20 metre tunnel of light and a disco mirrored ball tree, with a little stop off to see Father Christmas in his grotto. 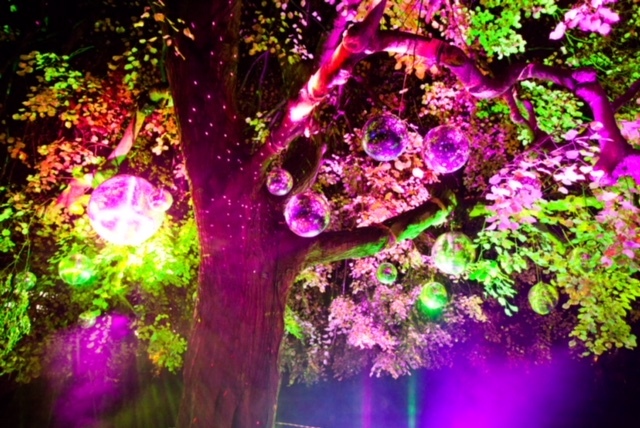 And just at the point where we all needed warming up, we reached the grand finale – a lawn of glowing fire balls. 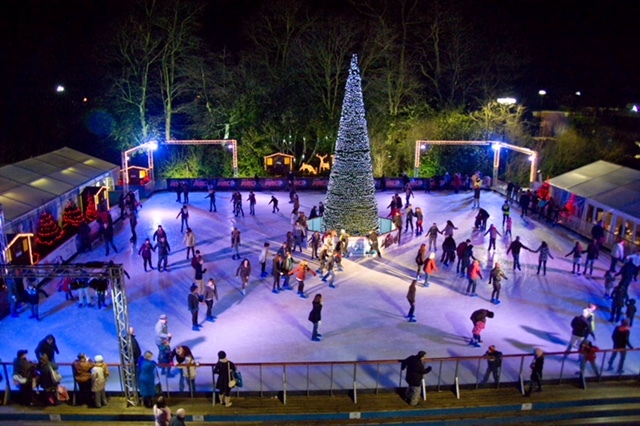 It make for a spectacular and warming sight, inviting you towards a bar selling mulled wine, cider and hot chocolate. Although the big pull for Archie and Tilly was the chance to toast giant marshmallow over a huge fire pit – which was also useful to warm our rather cold hands. All in all a fabulous day out in a city that is steeped in history and character, and I defy anyone not to feel full of festive cheer by the end of it.